Dustin attended Buena Vista University in Storm Lake, IA where he received his BS in Biology and minor in Exercise Science in 1999. After working at the University of Nebraska Medical Center and coaching at Central High School, he received his teaching degree in Biology and Master in Curriculum and Instruction from the University of Nebraska-Lincoln. He taught physical science, life science and Cisco Certified Network Associate (CCNA) course at then Tecumseh High School (now Johnson County Central) along with technology support. As technology grew, Dustin became the technology director at Johnson County Central while teaching the CCNA course, head football coach, head boys track coach and FBLA Adviser. 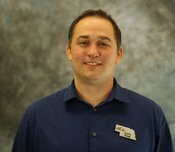 In 2016, Dustin joined the ESU 4 team as Network Administrator and in 2017 as Director of Technology.